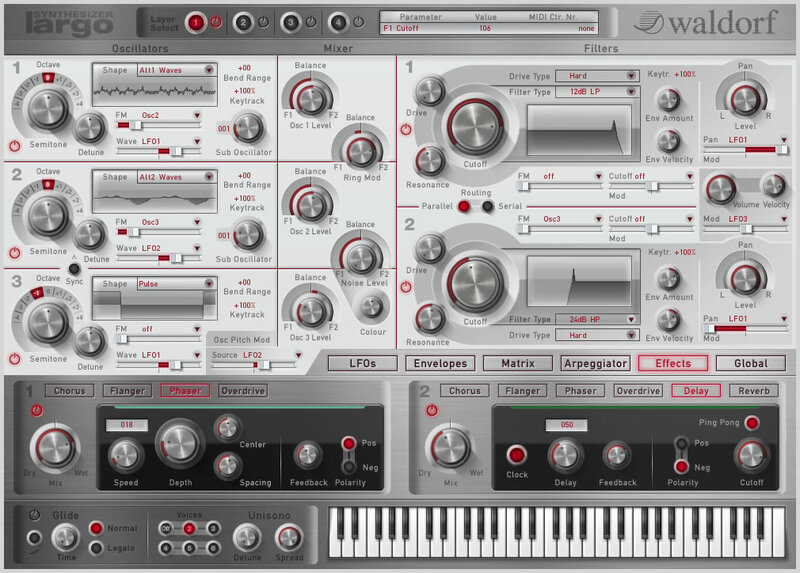 Many producers and synthesizer enthusiasts asked Waldorf for a full-blown Waldorf Synthesizer for their virtual rack. Waldorf listened, enter Largo. 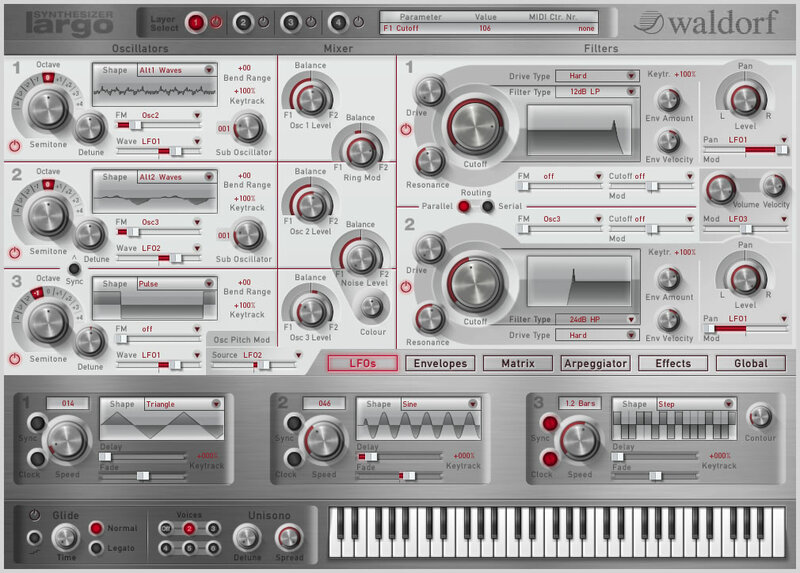 Largo is the first pure software synthesizer with Waldorf DNA. 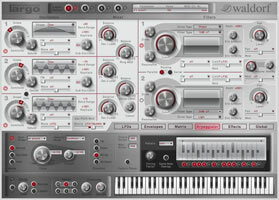 Largo mirrors the technology used in Blofeld and Q hardware synthesizers. 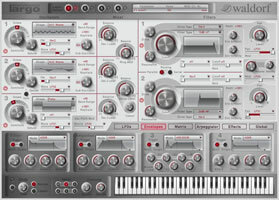 As with every Waldorf instrument, ergonomics are a core feature on screen as well. 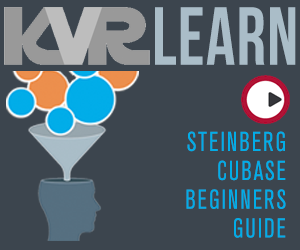 Your eyes will be pleased with a clearly structured, graphical user interface that supports your workflow intuitively. Largo offers three fat oscillators, two of them with sub oscillators. 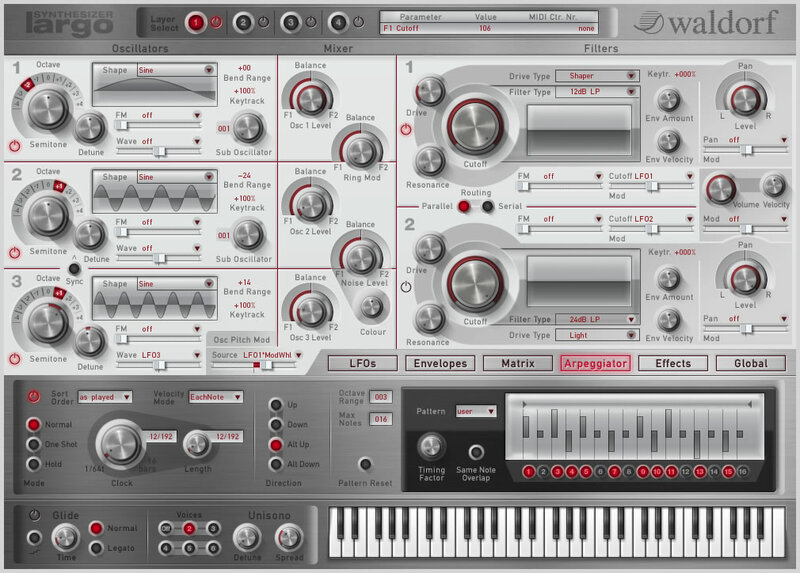 These oscillators include models of classic analog waveforms as well as a selection of waves from the PPG and Waldorf Wave stored in two Wavetables. All these run through two Waldorf multi-mode filters with steep cut-off, resonance up to self-oscillation and a drive stage to add even more punch and graininess to the sound. Ultra-fast envelope generators and flexible LFOs as well as an easy to understand, yet extremely versatile modulation matrix make for a sound designer's dream. 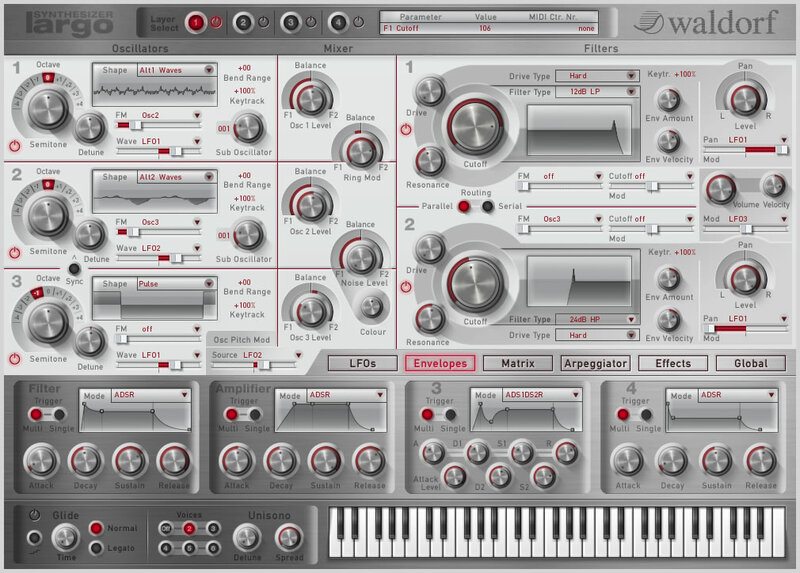 The filters have always been a core part of any Waldorf instrument. With outstanding expertise in both analog and digital synthesis, the developers took utmost care in developing the filters. Use the comb filters for plucked, stringed or blown sounds. Band pass, high pass, low pass and notch filters are all available with 12 dB and 24 dB slope. 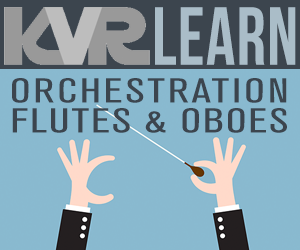 All of them sound extremely accurate and add pure sonic quality to the sound of your music. 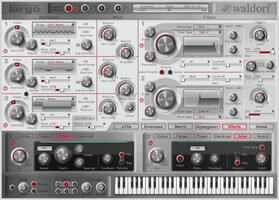 The clearly arranged user interface helps you to create your own powerful synthesizer sounds in a breeze. Oscillators and filters are always in direct access while the sub-modules are only a mouse click away. 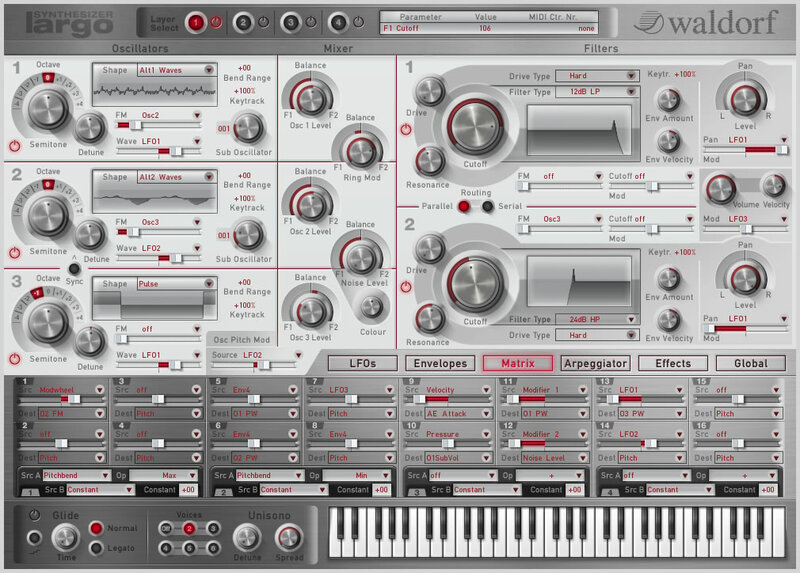 It has the same exclusive voice architecture as the Q and Blofeld synthesizer line, fully integrated into the total recall system of your Digital Audio Workstation. 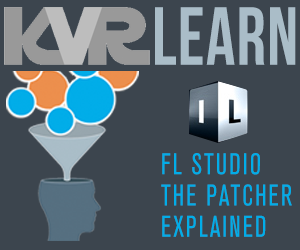 Up to 256 voices per instance (depending on available CPU power). Up to 4 layers per sound. 4 stereo outputs (alternatively 1 stereo sum). Host automation of almost all parameters. MIDI Controller automation of the most important parameters. Pulse with Pulse Width Modulation. 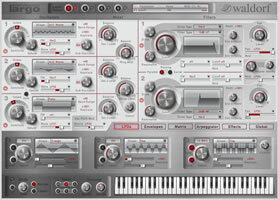 Wavetables: Q Alt 1 and Alt 2 Wavetable. Frequency Modulation between Oscillators and Noise Generator. Ring Modulator for Osc 1 / 2. Noise Generator with Noise Colour. Low Pass 24 dB / 12 dB. Band Pass 24 dB / 12 dB. High Pass 24 dB / 12 dB. Notch 24 dB / 12 dB. Comb Filter with positive / negative Feedback. Modulation Matrix with 16 Slots, freely programmable. Modulation Speed far into Audio Range. 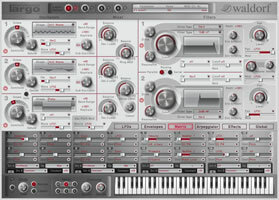 Modulation Sources include all internal Modulation Sources plus various MIDI messages. Modulation Destinations for almost all continuous sound parameters. Oscillator 1 / 2 / 3 Frequency Modulation. Oscillator 1 / 2 / 3 Pulse Width Modulation. Filter 1 / 2 Cutoff Modulation. Filter 1 / 2 Frequency Modulation. Pan 1 / 2 Modulation. 4 Modifiers for transforming Modulation Sources with various Algorithms. Note Retrigger with adjustable Start Phase. Freely drawable LFO waveform with 16 steps. Single Trigger / Retrigger per Envelope. ADS1DS2R (2 Decay/Sustain stages plus adjustable Attack Level). Loop S1S2 (Loop between Sustain 1 and 2). Loop All (Loop over all stages). Poly, Mono, Dual or Unisono Mode with selectable Voice Count. Hold and One Shot modes. Range up to 10 Octaves. Various methods to modify Note Sort Order. Freely programmable Arpeggiator Pattern with up to 16 Steps. Random note from Note List. First and/or last note from Note List. 2 Effect slots per layer. Delay (2nd effect slot only). Reverb (2nd effect slot only). 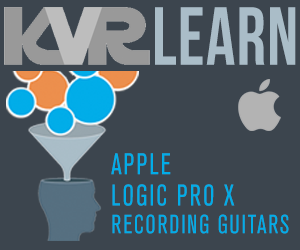 Pricing and release date have not yet been announced but Largo will be available as VST and AudioUnit instrument plug-ins for Windows and Mac OS X.